Twelve distinguished historians, political theorists, and literary critics present new perspectives on multiculturalism in this important collection. Central to the essays (all but one is appearing in print for the first time) is the question of how the Jewish experience can challenge the conventional polar opposition between a majority "white monoculture" and a marginalized "minorities of color multiculture." This book takes issue with such a dichotomy by showing how experiences of American Jews can undo conventional categories. 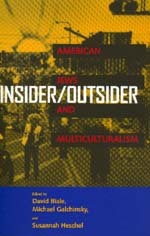 Neither a complaint against multiculturalism by Jews who feel excluded from it, nor a celebration of multiculturalism as the solution to contemporary Jewish problems, Insider/Outsider explores how the Jews' anomalous status opens up multicultural history in different and interesting directions. The goal of the editors has been to transcend the notion of "comparative victimology" and to show the value of a narrative that does not rely on competing histories of persecution. Readers can discover in these essays arguments that will broaden their understanding of Jewish identity and multicultural theory and will enliven the contemporary debate about American culture generally. David Biale is Professor of Jewish Studies, Graduate Theological Union, Berkeley. Michael Galchinsky is Professor of English at Millsaps College in Jackson, Mississippi. Susannah Heschel is Associate Professor of Judaic Studies at Case Western University.